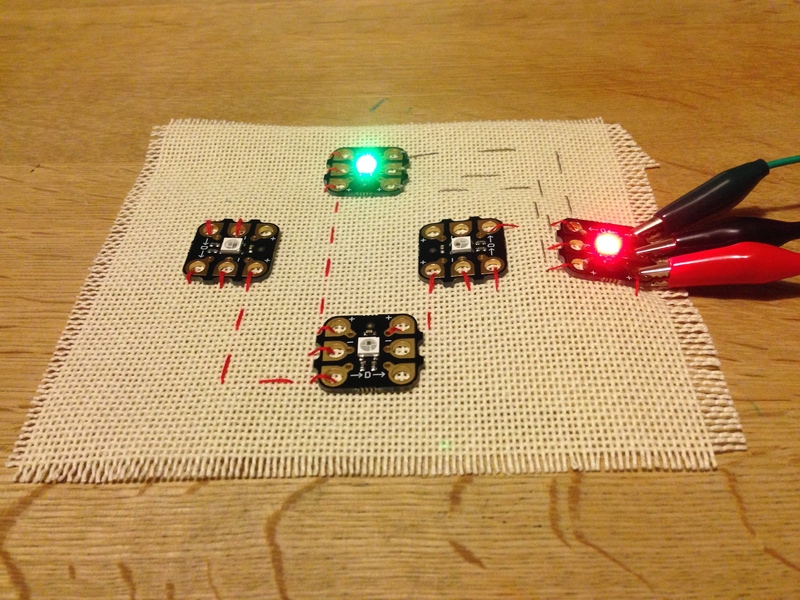 In this project conductive thread was used to connect a chain of Sparkles together. This meant we ended up with far fewer trailing wires and bulky crocodile clips. 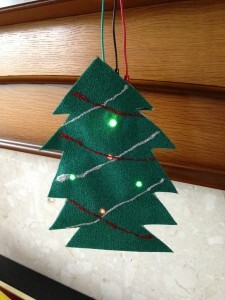 First the Sparkles were tacked onto the evenweave fabric with standard embroidery cotton. 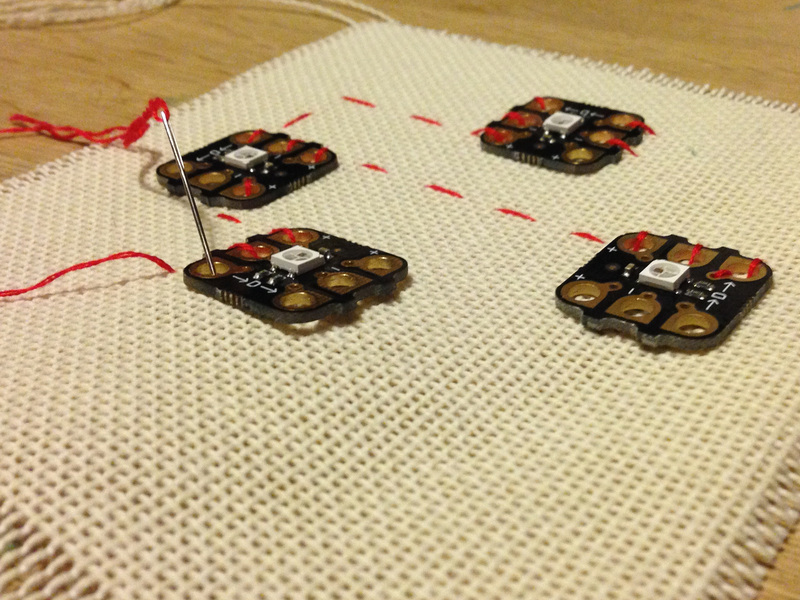 This held them in place for stitching with conductive thread. 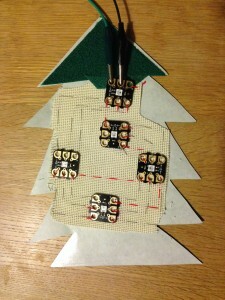 The connections have to go into the left side of each Sparkle and out of the right side to the next Sparkle in the chain. 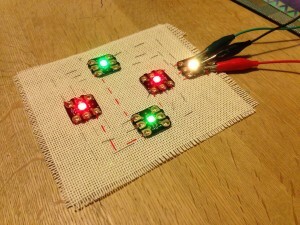 To avoid crossed wires (threads), the Sparkles were arranged with their connection pads forming a rough “spiral”. The conductive thread needs to form a good contact with the gold pads so two or three tight stitches were sewn at each connection point. The evenweave fabric proved to be a good choice as it enabled the stitches to be sewn right on top of each other. 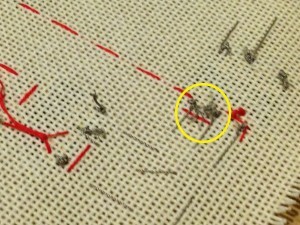 A simple running stitch connects one Sparkle to the next in the chain. 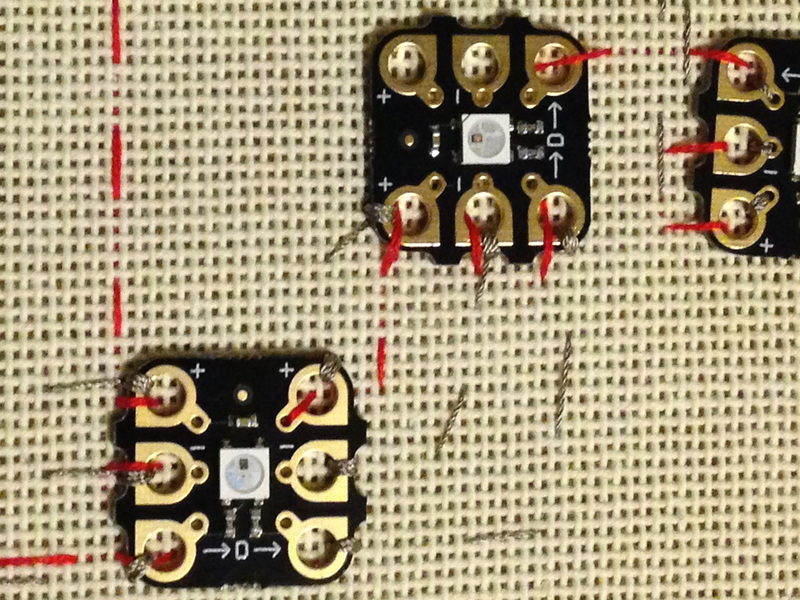 It is important to keep checking that different pieces of conductive thread are kept separate. 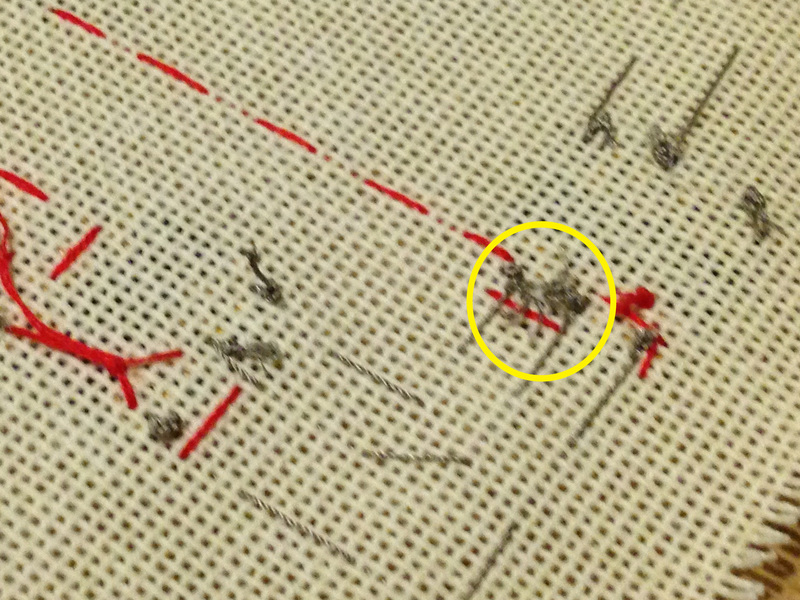 In the picture to the left, too much frayed thread has been left on the back of the fabric after tying off. Threads from two separate knots are touching, causing a short circuit. 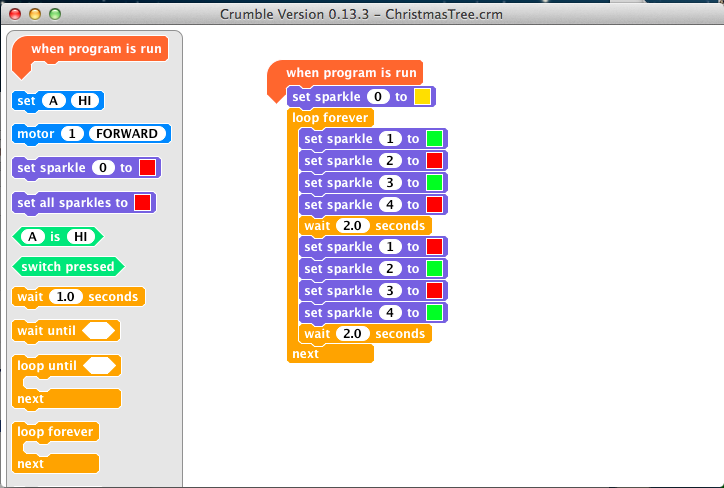 The Crumble program is shown, left. 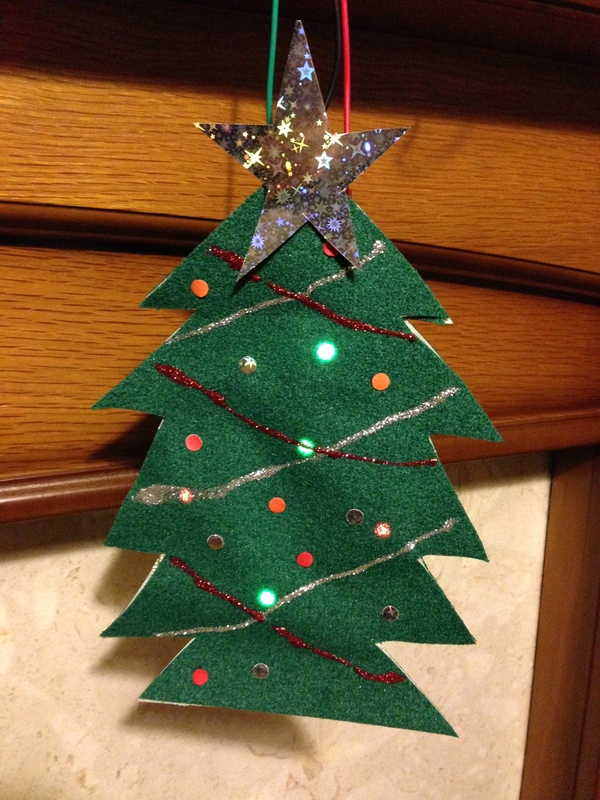 Originally, I thought that Sparkle “0” would be the star at the top of the tree, which is why it’s gold, but in the end the shape wasn’t quite right. 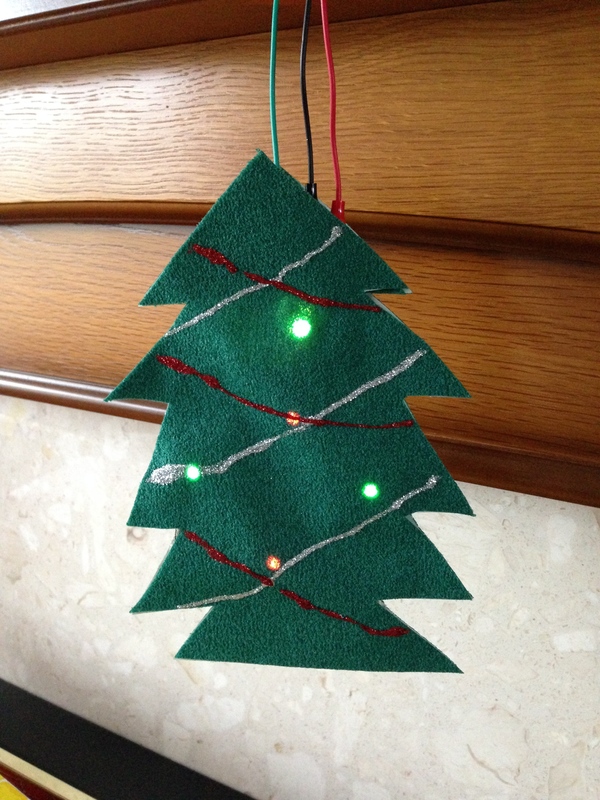 It would have been simple to re-program the Crumble to change the gold to green/red, but, shining through the felt, it looked green so I never got round to it..
Two matching Christmas Tree shapes were cut from the green felt and the Sparkles were sandwiched between them. 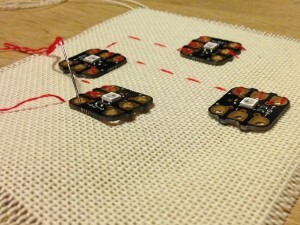 Extra pieces of felt were inserted at the top, just behind the input pads of Sparkle 0. 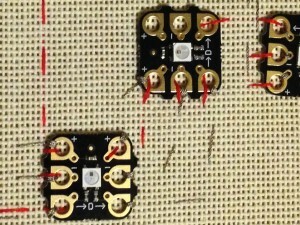 This stopped the front and back sticking together so the croc-leads could be connected and disconnected. The Christmas tree was then decorated with glitter glue and stickers. 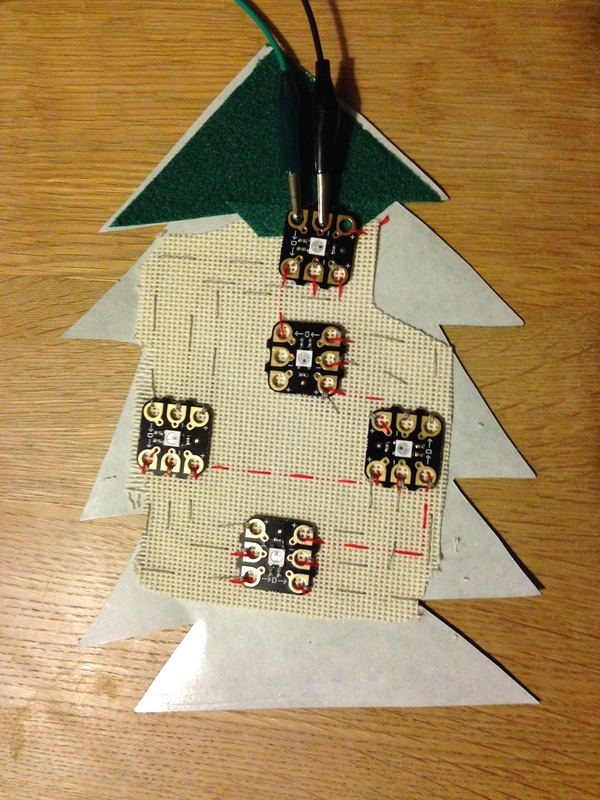 The battery box and the Crumble were concealed among Christmas cards on the mantelpiece and the croc-leads were sellotaped so that the ends dangled down. 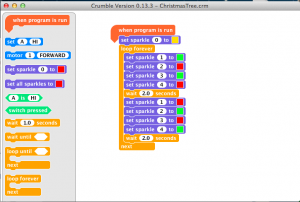 The croc-leads were connected to the Sparkle within the Christmas tree, so it hangs from the mantelpiece. Crafty Crumble Creations: A “police” helmet.